The 10-player class of draftees was a pretty back-to-basics group consisting of three offensive linemen, two defensive tackles, three running backs, a tight end known mostly for his blocking, and a lone receiver taken in the seventh round. RENTON — There ultimately wasn’t a lot of glitz and glamour for the Seahawks in this NFL draft. Instead, the 10-player class of draftees was a pretty back-to-basics group consisting of three offensive linemen, two defensive tackles, three running backs, a tight end known mostly for his blocking, and a lone receiver taken in the seventh round. In essence, nine players who likely will do their most important work at the line of scrimmage and between the tackles. The three offensive linemen hit on each position — one tackle (first-rounder Germain Ifedi), one guard (third-rounder Rees Odhiambo) and a center (sixth-rounder Joey Hunt). Both defensive linemen played primarily tackle — second-rounder Jarran Reed and fifth-rounder Quinton Jefferson. The Seahawks made a trade with the Patriots on Saturday to move up and take Jefferson, a Maryland product, with the 147th overall selection. And among the running backs was Arkansas’ Alex Collins, a 217-pounder known more as a bruiser than a burner. 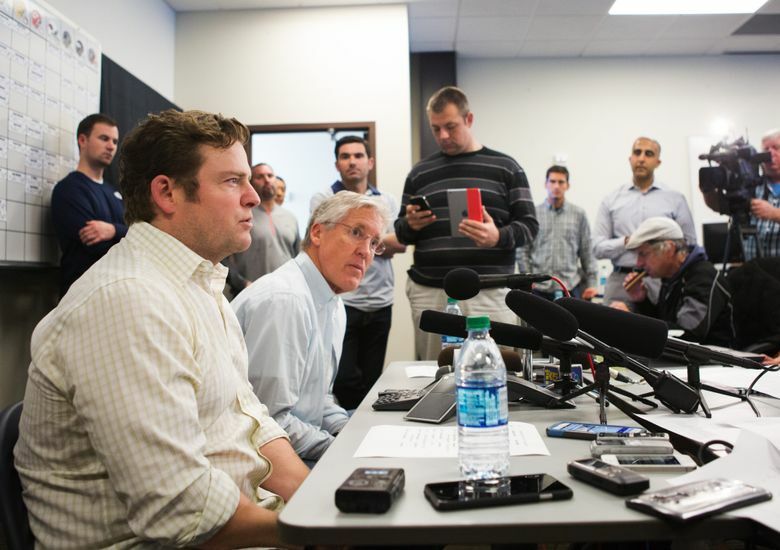 “This draft in particular makes me feel like we have really bolstered areas that you are going to have to battle for your spots, and everybody is going to have to really bring their best, and we really couldn’t have asked for more than that,’’ Carroll said. Carroll and general manager John Schneider said the number of linemen and running backs taken was due to the fact the draft was strong in those areas. Still, it also allowed the Seahawks to make a statement about the value the team places in improving its lines and its continued emphasis on running despite the retirement of Marshawn Lynch. The three offensive linemen add depth and competition to a spot that was considered the team’s biggest weakness a year ago. The Seahawks aren’t ruling out that any of the three could play immediately as Seattle looks to remake a line that lost left tackle Russell Okung and right guard J.R. Sweezy in free agency. Hunt’s selection marked the first time the Seahawks had taken a center since drafting Max Unger in the second round in 2009. Jefferson joined Reed as players who can help the Seahawks replace departed nose tackle Brandon Mebane, who was a key in helping Seattle lead the NFL in run defense last season. 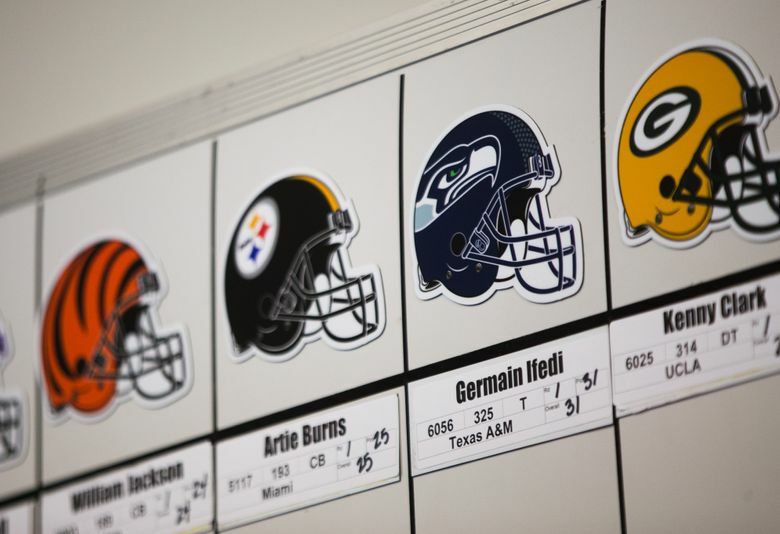 Seattle entered the final day with no scheduled picks until the late fifth round, at 171. But when the Seahawks saw Jefferson available, they made a trade with the Patriots to give up a 2017 fourth-round selection and swap seventh-rounders to move up to get him. It was just the fourth time they have moved up in the draft in the Schneider/Carroll era. “We didn’t see a ton of players like him (remaining on the draft board) after that,’’ Schneider said. On the final day of the 2016 draft, John Schneider and Pete Carroll discuss the drafts made for the Seahawks. The Seahawks made 10 draft picks over the 7 rounds, concluding with running back Zac Brooks as the 247th pick. After taking Jefferson, the Seahawks nabbed Collins at 171, Hunt at 215, California wide receiver Kenny Lawler at 243 and Clemson running back Zac Brooks at 247. Seattle entered the draft with just three running backs on its roster — Thomas Rawls, Christine Michael and Cameron Marshall, a free agent signed recently out of the CFL — and doubled that total in the draft. Rawls is recovering from a broken left ankle, but the Seahawks said hitting the position hard in the draft was not any reflection on his rehab. The 10 draft choices tied for the fourth-most in the NFL and was the most for the Seahawks since 2013. Though all drafts are critical, this one was viewed by many around the league as especially key for the Seahawks to stay at a Super Bowl level after getting some inconsistent return on recent drafts. Schneider said he couldn’t say the team’s roster is better now than it was a year ago at this time. But he also didn’t argue the point when it was raised.